"As first time hikers, rafters, and campers you can imagine the excitement and anxiety as our trip approached. Once we met up with you all at the end of Bright Angel Trail the anxiety was gone and the excitement rose exponentially. Throughout the trip your technical expertise and prowess were exemplary. The overwhelming care and kindness that you showed everyone, however, was the true gem for our family. You all truly care about the people you are with and that is what made this our best family vacation to date. Thank you from the bottom of our hearts!" -- Juan, Stephanie, and Spencer A. "Another amazing journey with you and your crew! All your hard work and organized way of getting a group down river makes a Canyoneers trip an incredible way to explore this beautiful place. Now that we've covered the whole river, its time to think about other ways to experience the Canyon -- and that we will, thanks to the introduction you have given us over the past few years. To a person, this Canyoneers team was as good as it gets. All aspects of the trip were well planned and perfectly executed. Thank you all for a great experience that none of us will soon forget!" 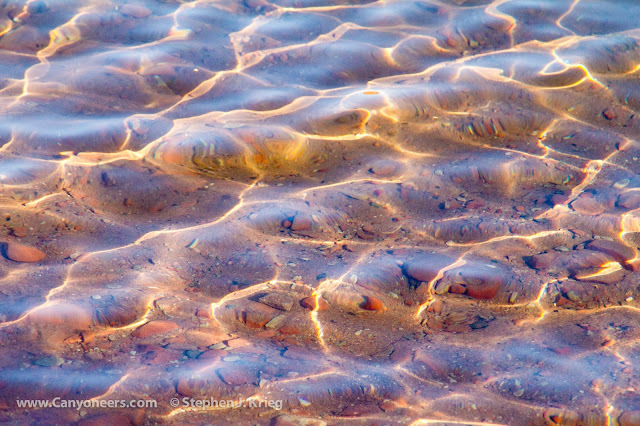 -- Ned H.
Cliff for his dry wit, gentle demeanor, and deep knowledge of the Canyon. Thank you for sharing your music and guitar. Greg for his not so dry wit, earnestness, knowledge of beavers and always declaring the parents victors in the water fights! Thanks also for bringing the Sandra. Dr. Tom for teaching me to row and believing in my abilities. Jason for the ever present twinkle in his eye and the pranks he pulled on the boys. Next time I hope he'll teach me how to stand on my head. Tom Jones for his gentle demeanor, wonderful voice, and for being so efficient setting up the Duke. Paul for providing a new imaginative game every night that kept us laughing and brought the kids and adults together. Carolyn -- The mother of the mothership -- who watched over all of us with a constant smile on her face and found us a few more beers when we ran out. Wishing you many more years of successful trips and glorious white water!" -- Polly H.
"Dear Amity, thank you for a wonderful experience I was able to share with my grandsons, Zach and Cortez. After a rough start down, with Omar's help, and my 'bail-out' in Crystal, I feel like a Canyoneers Veteran. This trip will be in my memories for the rest of what I hope is a very long life. P.S. Kudos to the fun and professional crew." -- Bill C.
"This was my second fabulous trip with Canyoneers. I completed the upper part in 2008 with a friend, celebrating her 60th birthday. We hiked out the Bright Angel Trail. I left with a yearning to see the rest of the Canyon. This trip, with the hike down Bright Angel, completed that trip for me. My first experience with Canyoneers was fabulous. It is the reason I chose Canyoneers for this trip. 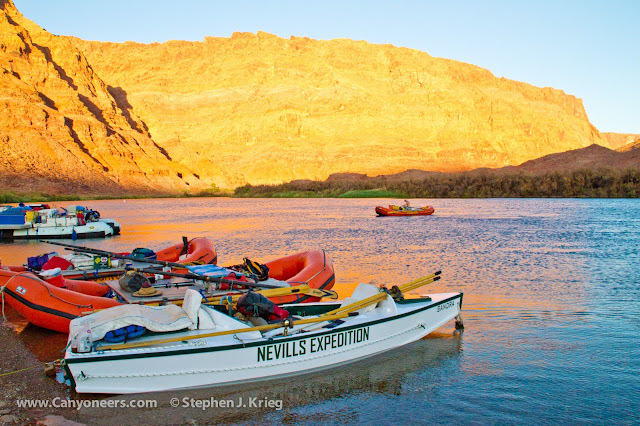 The quality of the crew (their knowledge of both the river and the Canyon and canyon safety, as well as their great attitudes), make the trip incredibly enjoyable and informative. 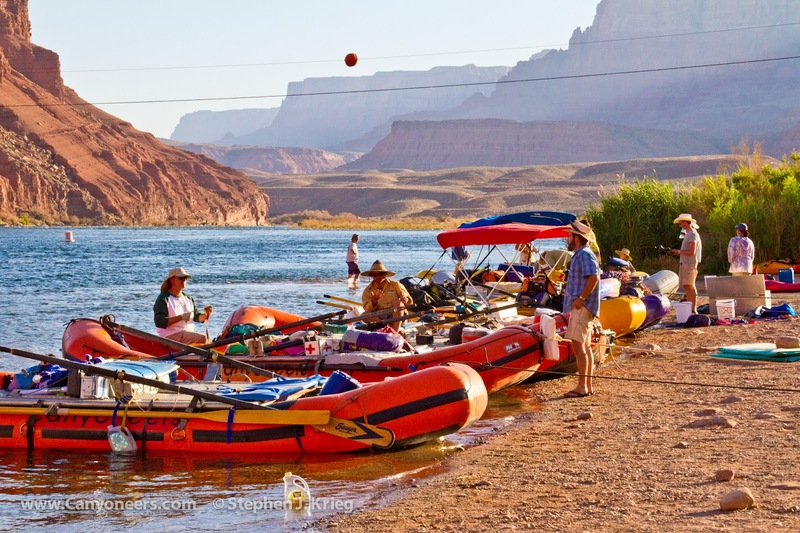 Two characteristics that set Canyoneers apart from other trips, in my opinion, are the inclusion of Sandra on the oar trips, and the attention to safety of customers on the hikes in and out. 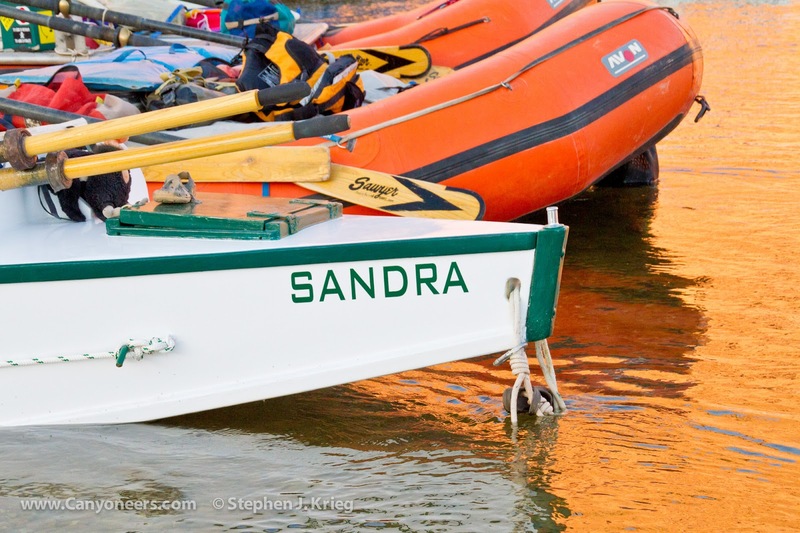 The Sandra (and Greg) brings a sense of history and adventure that cannot be found in other tours. The attention to customer safety on the hikes assures that what we have chosen as an adventure doesn't become a disaster. Many thanks to the many people on the crew and at Canyoneers who made this adventure possible. I have already recommended this trip to many friends and colleagues. Three have already participated in one of your trips." -- Cherie K.
"Amity and all your team -- This has been a life changing experience for myself in so many ways! I walked into the Canyon with my friend Cherie and two thirds of the way down was overcome by heat, drop in elevation, and fainted. Omar took wise care of me and was patient and confident in helping to guide us further down the path, and took my backpack with his. We made it down! I thought all was great but the heat, electrolytes being thrown off made me dehydrated and out of it. Nurse Carolyn and Tom took gentle and professional care of me, as did Dr. Tom, who found the magic cure: beef bullion! It fixed me mostly right up! I so enjoyed every crew member -- their incredible intuitive teamwork and support and respect of each other. Every day was a paradise and adventure in itself, and the crew coached us into reaching our full potential into uncomfortable, stretching experiences which ultimately change us internally and externally in our ability to help others reach further in their lives. Lastly, I got to ride the Sandra on the last day of the trip with Greg and my friend Cherie. Based on my sick beginnings I was apprehensive to ride it, but day 8 what a chance to experience something again out of my comfort zone. Well, what a ride it was! The rapids were much more exciting than one could have ever anticipated -- what an adrenaline rush riding the Sandra was, and we were so prepared for the worst with Greg, but it didn't happen. We had an incredible and wild ride and rush with a 3-some team! 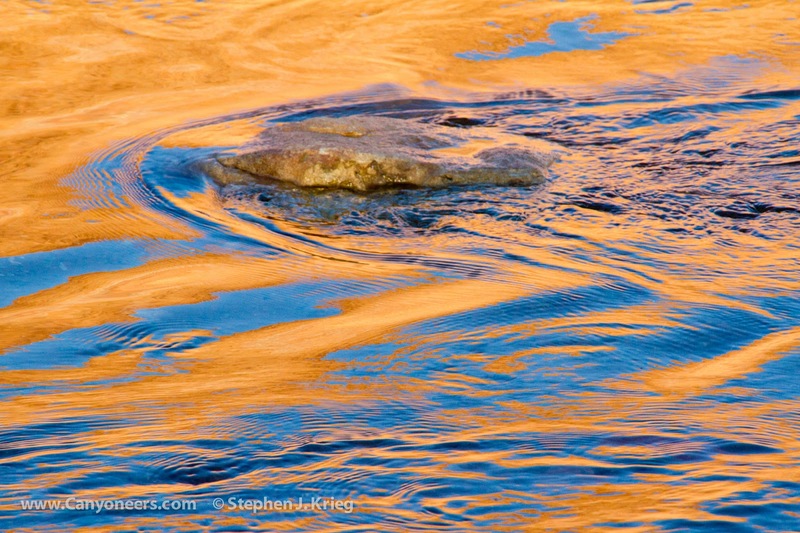 Thank you so much for bringing the Sandra and so enhancing the rapids and trip riding option. 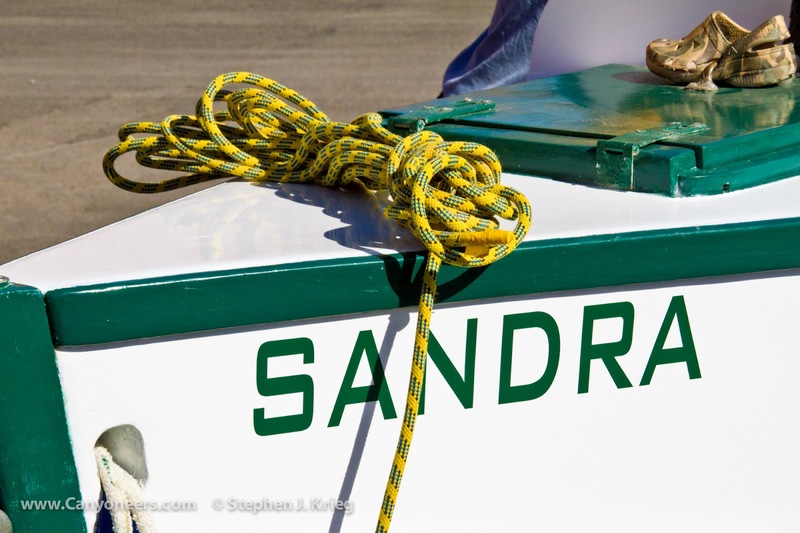 Having the Sandra truly sets your company apart from others, with the legacy and history it is so unique and special! Thank you to all the crew, love to you all! Amity, the beautiful fearless leader; Tom, the big boatman, and Carolyn, the jack (angel) of all trades; Cliff, master singer, storyteller, dry sense of humor; Jason, calm, funny, always watching out; Paul, quiet and kind and very welcoming; Tom, the Doc, the great discusser and great sense of humor, especially as related to his buddy Greg, who has the history, passion, and great stories. So thank you again for your love of the river, expertise with rowing and scoping out the river and joy in sharing your knowledge and skills! Have a great rest of the season and good luck in the future!" -- Suzanne P.
"To the crew, thank you very much, this being my fourth trip speaks for itself. You guys did a great job. See you in the summer of 2013." -- Joe D.
"Jeff and I thank you for a wonderful vacation. This vacation is special because we were here to celebrate our 50th birthdays and 30 year marriage. The trip exceeded our expectations! The crew was wonderful! They were professional, always protective of our safety. We are also appreciative of the wonderful stories of the Canyon. They brought the trip to life. Thanks for the special attention you gave to my interest in geology. This made the trip more special. Also, thanks to Tom with his assistance with Jeff's foot trouble. Wishing you all the fulfillment of your hopes and dreams." 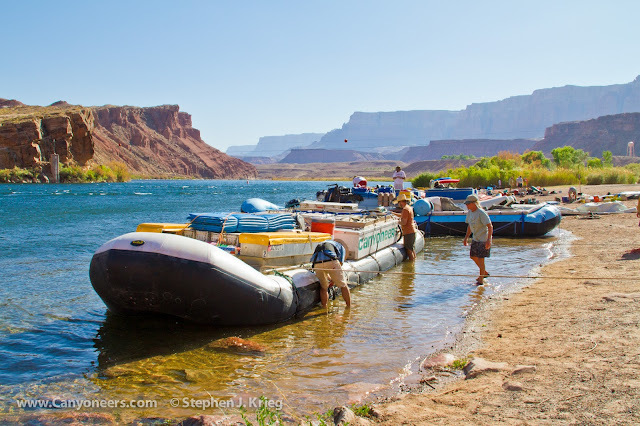 -- Jeff and Lori V.
"To the crew: As we descended down the ramp at Lees Ferry with excitement and many unknowns you made us feel welcome and at ease immediately. We knew we were crossing off one of our big vacations from the to-do list and are so glad we chose Canyoneers. The entire crew brought different perspectives and expertise along with a great attitude. We quickly got on river time and forgot what day it was, even. We are so glad we chose to do the entire trip instead of wondering what the other half was like [actually, the Upper Grand is one third of the total length, the lower ('Best of the Grand') is two thirds of Grand Canyon]. The food was amazing and we can hardly wait to try some new things in the dutch oven next time we go camping. We loved all the stories and the camaraderie amongst the crew. Thanks for Cliff and Paul for the great stories and hikes they led with Tom and the gang assisting us over the rock. Amity always found the big wave; it may be a little splashy! 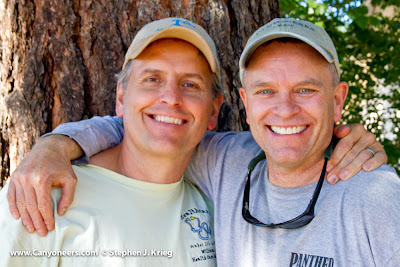 Greg and Tom brought so much fun and expertise with Greg's river history and thanks to Tom for helping keep us healthy. Kudos to Jason as he always went out of his way to make sure we were all set and had whatever needed, even taking Lori on little specialty hikes. Carolyn was always there for us, helping with drinks, shoes, and everything else needed. This is a trip we will never forget, and was even better than imagined, thanks to the crew. It was great to share this two weeks with all of you and feel you love of this very special place. As we approach Pearce Ferry, we will miss all of you and the River Time we shared." -- Jeff and Lori V.
There is still limited seating on the July 19 and August 30 Upper Grand oar trips!